Early in the morning, you do a Google search for your site to find out that your site’s hard-earned rankings have suddenly succumbed. In most cases, you should only blame yourself that you didn’t do your best to avoid getting into this dreaded situation. But in some cases, you just can’t be aware of all the possible scenarios in which your site might lose organic search traffic. Important: Whenever your site’s rankings start dropping, keep calm and start looking for causes and solutions. Surely it’s a motive to panic, but it’s not the end of the world, and most definitely not the end of your site. 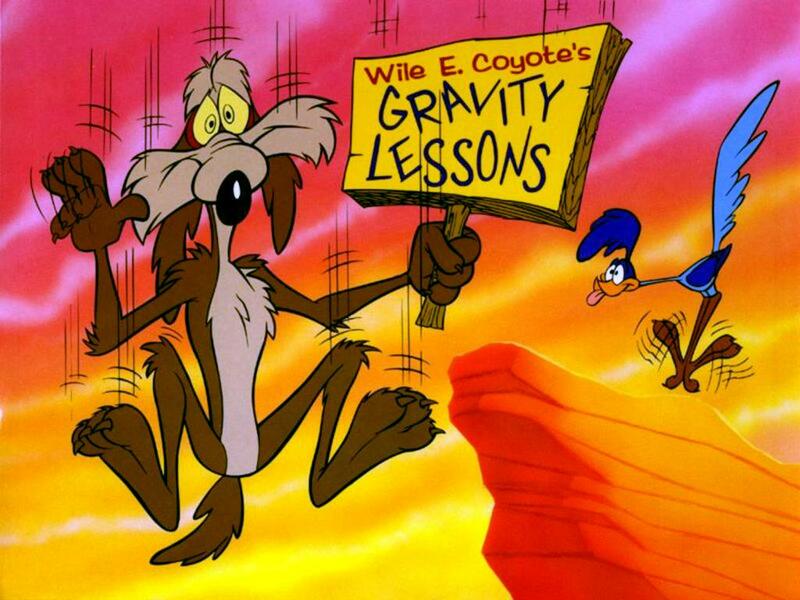 It’s just like the case of Wile E. Coyote, the beloved cartoon character that ran after Roadrunner; finally he ended falling from a cliff or something, but that didn’t stop him. The site has some issues that led to the ranking drop. The first thing you need to do is to asses the situation and understand what’s broken on your site. I’m going to cover some of the methods which could save your site from “falling off the Google’s SERPs” (these are only some of the major reasons, as it’s impossible to encapsulate every possible situation in one article). Here are 6 important reasons way you site may have lost its Google Ranking and how you should address the drop. 1.1. How to Diagnose a Google Penalty? This is usually a big drop in rankings, that happens over-night. If you notice that your site drops more than 10-20 positions on a multitude of keywords, this could indicate a penalty. A big difference between algorithmic and manual penalties is that the first ones are automatic and are usually released with various Google Updates, while the second ones are manually applied by a Google employee. Given the fact that Google made a habit out of making updates without clearly stating it, you should constantly monitor for ranking changes. You know you’ve been penalized by Google if the drop is harsh and swift, and you can see that your site continues to rank on other search engines like Bing or Yahoo. 1.2 How to Identify & Recover from Google Penalty? Your best bet at identifying exactly what happened would be to first check your Google Webmaster Tools account. There you’ll have notifications from Google regarding manual actions they’ve taken against your site. First you’ll have to see if there are notifications in the Site Messages menu. Here you’ll be alerted if there are any issues that GoogleBot detected. You should also check the Manual Actions section from Google Webmaster Tools, since that is the only place you’re going to be announced of the Google penalties that have been applied to your site. You need to accept the decision with calm and proceed to solving the issue. Identifying exactly what harmed your site is the first thing you have to do. If it is on-page, you need to reconsider your content and linking. Check for duplicate content. If it is off-page, you need to detect and remove the links which were considered unnatural. For the remaining links that still point to your site and weren’t removed, you can simply disavow them. In order to recover from manual penalties, you’ll have to submit a reconsideration request. Be aware that it may take some time till you’re going to regain your position in the SERPs. 1.3 How to Prevent Being Hit by a Google Penalty? Continuously track your links and risk of being penalized with specialized tools that alert you when something starts to happen on your link profile. 2.1. How to Diagnose This? This is usually a slight drop in ranking. You will see your competitors site that outranked you and the other sites will usually be in the same positions as before. 2.2. How a Identify a Competitor Outranking Issue? You should constantly monitor and analyze your competitors sites and social profiles to better understand what are they doing. 3.3. How a Prevent Yourself From Being Outranked by a Competitor? Tracking your main competitors and understanding their link building strategies could predict their next moves. Keep a close eye on their content tactics and link building strategies. If they are steadily growing it means they’re doing something right. Understand and adapt your strategies accordingly. You should try to be very diverse and creative with your content marketing strategies if you want to differentiate yourself from the competition. 3.1. How to Spot if the Demotion is due to an On-page Issue? This is either a big drop or your site can not grow in rankings. It may be a sign of concern when your rankings start to slowly fall behind other sites, even though you’re seriously trying your best to create content and building links. 3.2. Where to look and how to Identify & Solve an On-page Optimization Problem? Check your site in GWT and understand if there are any problems from there first of all. Maybe you get a lot of broken links, or bad internal linking. Use the HTML Improvements feature to detect any problems with tags. “Abuse” the PageSpeed Insights as it gives you valuable information on what problems you may have with your site and how to fix them. Or maybe your site got hacked. All of these can be found in Google Webmaster Tools. 3.3. How to Prevent On-page problems? Always track your site in GWT and have GWT notifications enabled and sent to your email address. If you do this the chances of being a victim of on-page issues will drastically decrease. 4.1. How does this Demotion look like? This is either a slight or big drop. You will see huge spikes in link velocity, as you’ll have a lot of inbound links disappearing from your link profile. 4.2. How to Identify and Solve such a Drop due to Lost Links? Check your site’s lost links in the last 90 days. If you see a lot of lost links this might indicate the ranking drop. Check those links individually. If those links were intentionally removed by webmasters this might be a red flag to Google that those were unnatural links. I can not advise you here to ask them back, as Google may penalize you in the future. This drop might have happened sooner or later without those webmasters dropping those links. You need to build more organic and HQ links to your site. 4.3. How to Prevent Demotions due to Lost Links? Track your lost links actively with specialized software. When this things happen, you will be aware of the issue before it is too late. By monitoring the link velocity you can figure out if things are out of the ordinary, and act accordingly. 5.1. How does a Google Algorithm Update look like? This is either a slight or big drop. You might be scratched a little or you might be in serious trouble. In either cases, you might suspect an update if you’re rankings are suddenly and rapidly dropping. 5.2. How to Identify a Google Update? Check the SEO news sites for news related to a possible update in that timeframe. After this is cleared apply those findings to your own site. You need to identify what’s changed in the algorithm and how your site might violate the Google guidelines. 5.3. How to Prevent being hit by a Google Update? Be as organic as possible and build a brand. Focus on your product, community and technical issues with your site. 6.1. How does a Google Flux look like? This is either a slight or big drop. One of the things that you have no power over is the Google flux. This issue is very unpredictable and volatile, so you shouldn’t be on the lookout for any signs. This is a classic example of a Google Flux that might have been interpreted incorrectly as a negative seo attack. It isn’t any rule of thumb on how to handle these kind of situations and you just have to hold tight. You might be back in a few days. 6.3. How to Prevent? You simply can’t! Like I’ve previously mentioned, it is out of your control and you shouldn’t spend too much time trying to find the reason. These fluxes are normal for any site. If it is a Flux you will be back up in a few days. Everywhere you look on the Internet, you’ll find that the smartest website owners are one step ahead, being precautions on how they build and market their sites. Skipping the temptation of quickly jumping to the first position through shady SEO strategies, and by keeping up with the current updates are by far the best things you can do to protect and grow your visibility in the search engines. To make a quick recap, this article isn’t meant only for those of you who had their rankings destroyed, but it’s also for those lucky webmasters that didn’t had any problems with the Google algorithm or the Webspam team. The most surprising tactic that seems to be fruitful in this volatile SEO world is to always be informed. Today’s top ranking sites may be tomorrow’s bottom dwellers! Do you have any other demotions that you would want to add to this list? Great post indeed, Google continue to develop their algorithm, the best thing that we can do is to adapt to those changes. Right now we need to avoid Guest blogging, it will hurt your site if it’s not done in the right way. We are now experiencing the number 2. We got outRanked by a competitor. But the big issue is that, majority of these sites are new and don’t have enough inbound links, Page Rank or even social shares compare to us. Some of our competitors are also making site wide links from their client’s website, that they say Google really hates. analyze the competitors and understand their strategies and compare them to yourself. even if they have no backlinks apparently they do have them probably but they were not cached yet by the crawlers if the sites are very new. also it could be that the landing page does not have links but it is powered by the main domain etc. I am exactly suffering from this flux issue with my website. What is your take on my website apdpromotions.com.au. I have tried almost everything but I do not know where am i lacking. The competitors are only linked to their other domains while my website has numerous pages.please tell me. Does your website have enough links & are you constantly making new links? Hello, my previous host company just canceled my account without any prior notice so I have to find new host and deal with big site migration. It is already six days and we hope site will be life tomorrow. BUT I am SO worried because my site has totally dis-appeared form Google SERP’s. This is resulting in all waste of my efforts. I have ALSO LOST ALL the first page google ranking for targetted keywords. As an expert, can you PLEASE EXPLAIN this?? Will it come back once site is back?? this is based on what exactly happened. if a site is deleted completely and then reappears in a few days google may rerank those pages. But if it stays too longs it may never recover those. You should put it back ASAP and see what happens. I have been facing this issue. My 3 keywords were in top 3 but lost ranking dramatically. I can seen my Webpage on 6th and 7th pages of google search clearly. On page 3, 4 and 5 there are no webpages related to that particular keywords. Will Deleting a site and re-indexing it work? Please leave your comment. My website was on 1st position on organic search. but today when i goggle for the same keywords, its displaying my website on page 2. How it can be a sudden drop from number 1 position to page 2 directly. Please advise what I need to do to get it back to normal. I am currently experiencing the ups and downs of my ranking since 3rd week of January, the week before they announce the penguin update. Anyway, my question is aside from GWT(console) do you have any free tools that you can recommend for monitoring? One of the best explanations of ranking changes on the web. Thank you. The flux is very frustrating. I seem to experience it every two to three weeks, but I come right back. Great content in this post! Great software too (with a slick 14 day trial). I have a strange problem with my website. We add about 10-15 SEO articles everyday and ping them too. Then it do appear in search result some appears at 2nd page some at 3rd page and so on. And the these pages start dropping from google organic search. No manual action is taken against my website. I am talking about my website mentioned in my name plan trip. sounds like low quality articles. focus on high quality content. G can penalize too much low quality thin content. Our site has been running just fine and still has many page one rankings, but all of the sudden in the last week 2 pages of our site went from ranking on page 1 and 2 to dropping back to page 8 and 9. We never lost any links since these pages never had any to begin with. Any ideas? My website is relatively new. It is 6 months old and I don’t expect it to outrank anybody. However, I saw my links being demoted within 2-3 days. Initially it will come on the 1st page and then suddenly on page 3 or beyond. I couldn’t find anything online on this one. 90% of my post were showing on the first page, but suddenly disappear. I have tried all possibilities. Should I deindex and reindex all pages? Just had a massive drop but I assume it’s due to Google’s new update sadly. Hopefully I can see what’s changed and get back on track. Thanks for the tips. This article was extremely informative given the latest Google update! Keep it up! I’ll definitely be returning here for my dose of SEO news — you know your stuff. cool. tks for the appreciation Marco. This is really helpful. I have been noticing most of my contents going off search engine for no reason. Will look into GMT as advised. Thanks again. might be a Google Penalty. Penguin/Panda/Manual Action etc. Surprised you didn’t mention link acquisition rate, or switching a site over to https, or launching a new version of the site. All can have an impact. those are only six. there are much more than those and the ones you specified clearly would make the list. Mart Shark my website was ranking on number 4 but when i activated ssl and change http to https it got vanished please suggest me any solution for it . there are a lot of reasons why a site ranking may drop. I was wondering who did you speak at Google as they rarely offer voice consultation for Organic rankings. What do you mean by adding another Doctor to the name of the company? Changing the web address? Really good post about how to detect and how to act in front of rankings decreases. Be careful about keyword stuffing as well! Hi, i have a website rometransfer dot it. It is 9 months old and the niche is very competitive ( private limo service ). The good news is that i wrote more than all the others website out of there ( 360 posts) but it is still between 22-23 position ( webmaster tools). I know for sure that content is the king and i tried to make it in a valuable manner. Hi, Feeling very sad, till yesterday my ranking was great. But early in the morning faced sudden keywords ranking dropped like it never before there. Got a message from the Google webmasters, recommended about the coped content, its only contains about 15 to 20 %. Does Google measure so minor %s..??? Please suggest some more technical terms to cover up….!!! the message from Google is about a Manual Penalty regarding content/links on your site or due to external links pointing to your site? Google decrease my site rank.My site was working fine till 23rd november. But after that my site lost its half traffic. Now it is receiving 2k visitor daily.Please help me what problem is.I didn’t receive any plenty message. I am blogging at bloggingtipsandtricks.com earlier my blog post used to rank very high also the indexing speed was very fast but since 1 month Google is not ranking my post well as it used to be before and sometime even not ranking it after being indexed. I don’t know really what is the problem there are no manual actions taken on my blog. Could you please take a look and predict what might be causing this problem and how can I solve this. My domain was completed taken down by a customer service person through a domain company and it was her error. She deleted a hosting for a different company i had and also deleted a 4 year successful business. I had the website retrieved with frustrations and i had to prove my conversation with voice recordings that i did not want anything cancelled. I had an organic listing for 4 years and was on the top of the page and on the third line. She made a human error and has destroyed the hard work we put it into the site. I was praying and hoping that google may put us back up there again. We are now on page 4 at the bottom of the page. Over a human error. it came back up,,, hallalouya… thank you!!!!! I lost my ranking, but there is a notification in Google search console which says that “Search Console performed an infrastructure update that may cause a change in your data”. Is this May the reason behind my lost ranking? If yes then what should i do? this should not be related to your drop in traffic. Great post, just wondering is there an average time span for your site to be down during a flux? My site has maintained and in fact improved rankings this month but over the past 5 or six days traffic has fallen over 75%. No penalties either. I have never seen anything like this have you? If this is a flux and it’s affecting my site then how long does it usually take? Any ideas would be appreciated. thanks. Flux is usually affect rankings for short-term period. In my experience it takes not more than few days (1-3) while rankings dropped. You should try to find another reason of your situation. So here we go, my site was idol for a while and I did not do much with it. Considering that it was amazing when I used to operate it, but due to few issues decided to 301 it to another site for a while. Few days ago decided to restore it and start using it again. To my surprise, after I restored it, it shoots up to the top, over passing any other site I ever developed. I am talking about not just top 5 for major keywords, 1-3. I was like “great” time to make 7 digits. Two days later, it goes to nothing and some of the keywords are even out of index. There no indication of manual penalties or anything like it. The only problem I see is there another sub domain besides www. and it starts with keyword buy. (I used it for checkout on instapage) and both buy. and www. has keyword buy in the title and meta. I have a feeling that it is not penalty, it has to do with the fact that Google mixed up www. and buy. giving buy. a priority for the “juice” where buy. was not optimized for it. So now I 301ned buy. to www. and moved entire site from weebly to wordpress, completely changing and improving home page content. Hoping to see a come back. Has anybody else experienced anything of that nature? did it recover by now or still tanking? i have done one project yr ago which was too fresh and no backlink was their still it rank on top…later i genrated backlinks for that…presently i m working on very high competitive keywords and site need backloinks to score..
Hello Sir, I have checked all the point, you have mentioned. Almost all are ok. I am losing organic traffic in every month. I dont know what to do now. If it is Google Flux than what can I do? Also I am tracking my competitor. thanks for this post sir. I have got a little mental power, otherwise I had lost hope. SERP Fluxes usually take a couple of days. If it is more than that it might be another issue. Google changes their algo several times per year. What ranked yesterday might not rank tomorrow based on the new algo. That’s a nice article. A must read for all the SEO experts in order to understand the types of Google Penalties and how they can be recovered. Most of us give up when there’s any penalty, but we forget there are ways we can correct it and get our site back on the top. I got hit by a bunch of spammy links and half of my traffic dropped over night on Jan 28th. Then I submitted a disavow txt file to Google on February 7th and my other pages have dropped in the serps. How long will it take to regain my rankings for the disavow to work? Would submitting a new site map help to flush the system? Well guest blogging, buying backlinks, and automatic directory submissions shall do the trick to drop your rankings as well. Thanks for such a nice post will apply all in my projects n they are dropping in keywords . Great Post. I was also facing the same issues. But this post is helpful. We recently migrated our site to HTTPS from HTTP and after a week of the transition, we are experiencing over 90% of our organic traffic drop. We are not ranking for any of our keywords on Google. Not even for our brand name. This is disastrous to the business as a whole. The website is over 6 years old and has been welcoming a traffic of over 1500 daily visitors on an average all these years. We used to rank at 2nd or 3rd in Google search results for all our keywords and today we are nowhere to be found. We did not receive any manual action message in webmaster tools. So, we assume it is an algorithmic penalty. We did, however, leave few loose ends. We admit this. The 301 redirects were correct and the new sitemap was submitted in the webmaster tools. However, the canonical tags were probably not changed and there were multiple URLs displaying the same content. This has been corrected now. We believe that we have amended all those loose ends now. But the traffic is on the decline on a daily basis and this is horrifying. From some 1500 odd visits each day, we are down to 200 organic visitors now. I am panicking bad. It may be about the HTTP to HTTPs migration. did you check everything? There are a lot of stuff to check on such a migration. Maybe you mixed something up. Your website recovered its traffic? Do you have any news with your positions in google? Our analysis perceives that latest updates of the google algorithm were with respect to the quality of the content. I have never known about Google Flux and your post has made things clear for me. I was on Page 5 and find a competitor who was on Page 7 appear on Page 4. This is really frustrating. We are an ecommerce website and we see drastic drop in keywords for last 8 to 10 days almost top keywords from 185 to 117 can you explain what could be the reason? Did you check your SEO visibility? (https://explorer.cognitiveseo.com/?u=cupcakesonline.com&m=*U*#section/4) Also, did you have any change on your website? I think most of you say are correct but still nobody can be sure what’s the reason behind the dropping of our ranking. As we have written the excellent post we believe would help readers but still rank dropping could happen anytime. Probably the most make sense reasons are our competitor outranked us or just the way our template design to which doesn’t help visitors to browse longer as expected as the result bounce rates become high for that Google doesn’t think our page useful for readers. homepage dropped out of site. GWT does not show any problems. my Traffic also got down from November ending. can any body found the issues ? its regarding back links or on-page optimization ? Rady, you can analyze your site here (https://explorer.cognitiveseo.com/) and maybe you can correlate the drop with a specific issue. Hi, I am suffering from this issue, suddenly my website rank droped from fist page of google by many keyword and found your blog post. It’s too much beneficial and i’m sure i will gain my website ranking again with the help of your instruction. Hi, are you talking about this http://www.gwtproject.org ? I am not sure what you mean by GWT ? Dami, GWT is the abbreviation for Google Webmaster Tools. You article helped me a lot. Now I’ll control my site better 🙂 Thanks! My ranking of the website remains stable at 4th page and I am trying to find the cause for it. The above solutions I will apply to my website, where I have missed few techniques that are well explained thanks for the good wordings. The points are helpful one to rank the website in the limited time. I forget to recover the broken link information, that I need to focus a lot and thanks for the information. Does google have a blog where they release changes to their algorithms? You know, like an official blog or so? Thanks so much for sharing. Your points are spot on especially our sites besides doing keyword research we really need to do on-page and off-page seo. And guest blogging is great too. I also love Google plus, my articles are ranking in Google when I use Google plus. For a few days now, my blog has been experiencing a gradual decline in traffic by the day. I mean, there’s usually a 500 page view reduction as the day goes by. Practical ways to fix this has often proved abortive. Please, what do you think could be the problem here?? BTW, no obvious enough notification on GMT. This is really helpful. I have been noticing most of my contents going off search engine for no reason. Thanks again. I did not found any google penality on my Blog. But Alexa drop Every day. This is really amazing post related to google ranking, Thanks for providing useful information on your blog. Same thing was going in my site, I have search in google about it and got your article, it help me quite a lot. Thanks. Good work!!! I like the way you write your articles. Keep it up. Thanks for sharing this information. I have always wondered why my traffic keeps fluctuating. I have recently checked one of my client’s keywords on Google, and all the keywords dropped on Google.com. I checked my GWT and Analytics, both are going well and I also test my website on different SEO tools and found nothing. Then, why my site dropped? Waiting for your reply. What about duplicate content issues? Thanks for the amazing post. Recently, I bought a gig from SEOclerks and after that one of my sites’ ranking went completely down and was looking for such posts. someone help me out i lost my ranking no 4 after installing ssl certificate. someone help me out when ever i am trying to enter my website there is an error message showing website is temporally down. Lol! no one is gonna click on your dirty backlink! I don’t even know where to begin my story from, I have lost over 99% of my traffic Now struggling Please I have checked, Checked and over checked doesn’t seems to understand why.. Any Help from Expert willing to take a look? Please! i am also facing this problem. Thanks for awesome info, But i am facing some different problem like my keyword rank on google 1st page for next day its not there in google. this will happened regularly. please what to do? suggest me. Hey, I am Meenakshi. I was working on my client’s website. Before 5 days most of the keywords were on google 1st page. Then continuously till 5 days, my website was showing status “Account Suspended” because of the internal DNS Error. Yesterday, again all things gonna ok but I lost my keyword’s ranking.now keywords positions are out of 100. Kindly suggest me the strategy I should follow for the next to get my ranks back. Awesome article. A Great help. I was looking for my website issue and this article helped me finding its root cause. I’m seeing something that’s completely counteractive – I updated one of my pages that was ranking on page 1 for my main keyword. I basically just made it better, added a video, edited some text, added the page to the menu and (since the keyword was mentioned only once on page) I added the keyword in I believe two places…the keyword density is far below anything that could be risky. Two days after I dropped to page 2 for most of my main keywords on that page (and just that page). I’m confused…sometimes I feel like a complete newbie after a decade in SEO when I see stuff like this. Do you think it’s possible that Google has something in place to “recognize” the keyword you optimized for when updating the page. If the page doesn’t recover, should I simply revert the changes? My rankings are same but still traffic lost by 30%. Any reason? Few keywords of my website ranked on the 1st page but suddenly I can’t even see them in the SERP now. I checked my GCS but there are no issues or errors. I am still confused since those keywords were ranking on 1st page since 3 months and more. Can you take a guess as to what could have gone wrong? Sara, if you take a look here https://cognitiveseo.com/signals/ you will see that Google has a high volatility these days for the non-US countries. Hope you’ll recover fast! Helpful article, i face this issue on my site suddenly my rank dropped after reading this post i have a better understanding on how to do my SEO. I have the same problem, My though my traffic is same but ranking has dropped. Kindly help. Thank you so much for your tips and guide to fix these things. I saw large drop in my traffic from search engines and just landed in your guide after some research and this really helped. i have issue related to all mention above with my site, it was caused by on page issues and my traffic drastically dropped, after when i have fixed it, i never recover the ranking since 8 months ago, i dont know why, any help. A very perfect article to me to clear many of my doubts..Thanks for uploading it. But can you suggest me any free SEO tool which will give the result of my site analysis and exact backlinks list. Interesting post, surely it will help many SEOs who deal with this issue! I am so greatful that I saw this post. I learn lot about my website error. I was facing some problems and now I am ready to take action. I want to ask that 2 of my ranking keywords just disappeared from google. I had checked the manual action option in google webmaster tools their is no notification. I want to recover those keywords. How can i do so please suggest me. Thanks for sharing these points. Ranking for a keyword doesn’t mean you will stay up there. There are lots of factors that keep influencing the algorithm. I would like to ask that when I submit my post to Google then my post appears on page 2nd in Google, but after 24 hours my post appears on page 5 and 6, why is this happening? What i do ? Great post – thanks for all your help. Love the site and these sorts of in depth posts to help all of us keep up with SEO best practices. How much time it will take to recover traffic when you move your site to https given that everything is done correctly? Very well explained. I noticed a drop in our rankings too not sure what happened there still trying to identify the issue. I have just witnessed ranking fall of one of my project, and this post helped me to understand where I was lacking. Lots of thanks to you for sharing this valuable information for us. I have a problem. It seems like my positioning is constantly declining. I have checkout the competition but that isn’t a problem. The on-site SEO is perfectly fine. What can be the problem in your opinion? Can someone decrease my website rank? Like by any attack? Complaints? Or any trick ? Is that possible? If yes the. How to indemnified that? And how to prevent from this? Do you think what kind of Backlinks hurt and will cause dropping in Ranking? My site ultimately lost its ranking after installing SSL Certificate What to do Now? I was Not aware of this you should include this point, in the article, please. Google’s constant changes are quite aggravating. My biggest suggestion to everyone is to not put all your advertising eggs in one basket, especially if you have a local business. Think back to the days when the internet didn’t exist and incorporate some old school advertising techniques. Otherwise you could find yourself spending more time concentrating on Google instead of your business. I tried to change the title of my post where the competition blog was ranking better for the keyword it has in title. But after changing the title My ranking went down and down. Tried to build links BUT NO USE. My site is being hit by this ranking drop, I’ll take a bold step and take these tips into action to see what the outcome will be like. I am facing this issue for the last some weeks. My search engine ranking drops significantly for almost every pages. Thanks for a detailed article that covered various parts of the issue. It is very useful. Awesome article and very helpful. My site also affected recently due to some reasons. This article will help me to figure out the cause of the issue. Thank you. But still unable to figure out what is the reason for the rank drop! My site is online-paystub (dot com) and my keyword is pay stubs online. it was stable on the #2page of google for a whole month then all of sudden it is not ranking in #100.
in the past month it appears sometimes on #2 page and after that once again disappeared from #100. No manual webspam actions found in GWM and not even suspicious anchor text. no major link drops found. I waited for few days to rank back that keyword and that keyword rank back on POS for 2 days then once again same thing – dancing! please ping me if you found any updates or new techniques to recover rankings! Mine must be a google flux. I have noticed huge drops in rankings this past week. I’m hoping this won’t continue and hopefully changes soon. Hello one of my client’s site has been declining rapidly in SERPs in the past six months. From a few thousands hits a day to a few hundreds. There was a 404 error issue but that was fixed with submission of site maps but yet no recovery. There are no manual actions and links have increased not decreased. I have lost my ranks and keywords disappearing day by day. I think on page issue. also links lost. but possible there is quality issue because competitors make their pages with better then my site.. what you think about this one? i also mention my site in name box. My ranking is dropped I don’t know what is the reason, Average page view time is around 4 Minutes. Some time my page takes time to load. My ranking dropped overnight. My website is 4 months old and I don’t expect it to outrank anybody. However, I saw my links being demoted within 2-3 days. Initially it will come on the 1st page and then suddenly on page 3 or beyond. Why is this happening ? Sir, after adding breadcrumbs our sites ranking down. Before adding breadcrumbs our site ranking position is one but now my site ranking position is second page of google. How to fix it? All issues are correct which is described in this post. How to check broken link on website? I noticed a drop in our rankings too not sure what happened there still trying to identify the issue. What’s the best approach to resolve a traffic plateau? I noticed a drop in our rankings after implementing ssl . One major drop in ranking occurs due to ssl. When you turn on your ssl on website this will ultimately drop your ranking, I think you should research and find some solution for this problem. This is the article that I very helpful to me because one of my friend is facing traffic loss problem. and now i know the problem. thanks you for sharing this information with us. Thanks for sharing! I guess those ups/downs are due to new AI algorithm updates were sometimes valuable content with “not enough” authority gets penalized! This is the article that I very helpful to me because one of my friend is facing traffic loss problem. and now i know the problem. My pages were showing on first pages, but now they disappeared. What did I do ? Great to find this article! I have recently changed my website domain name but still have the old domain name automatically forward to the new website. But somehow my rank dropped dramatically on Google. I just can’t figure out how to fix this. I have no Manual Action detected. Could you please give me some advice? Thanks!!! It’s very useful information.Especially google flux, because I was checked before my site performance there is no unnatural links, there is no google penalised,So am really confused to how can I retrieve my ranking.So while I read your blog,I got some idea.Thanks for sharing us. Very informative and helpful post 🙂 My site has been suffering from a ranking drop lately. Fortunately, it hasn’t been a massive drop. It only happened to 2 of my posts. After checking the posts(sentence by sentence) on google, I found that there are some scraper sites that copied literally a few sentences of my blog posts. Google drops your ranking when you use black hat techniques If google drops your ranking in search engine or penalize your website it will notify you in Google search console in manual actions option. My website many urls removed from search day by day and some of links decreases their position first page to tenth page 🙁 what should i do any idea thanks. I had a major drop off from Google search for my article. Your article really helped me with the problem. Thank you so much for helping me. My website’s Main keyword ranking suddenly start dropping although I am working on it constantly. and have checked all the points mentioned above in this article very thing seem on the point. How I am able to recover its ranking again? thanks for sharing this useful and very important information! !